However, at Cascata in the foothills of the River Mountains outside Las Vegas our pre-round warm up instantly became a lasting memory. Walking on to the practice tee we saw what appeared at first to be clumps of some kind of dull brown bush growing about 200-yards away–up the slope of the lush green range landing area. But then a few of the “bushes” moved revealing themselves to be a herd of Desert bighorn sheep basking in the Nevada sunshine. After a couple of minutes, perhaps sensing our presence, they all stood and majestically walked off the range…and then up an almost vertical mountainside. Quite a way to begin our Cascata experience. 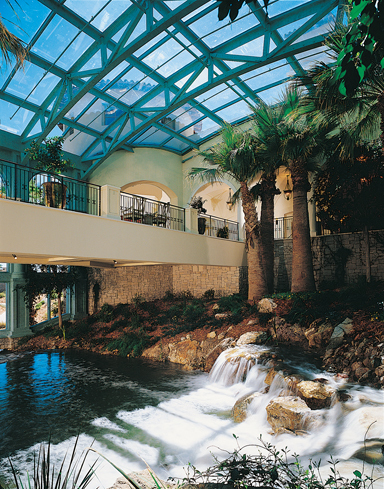 To play Cascata, which is owned by Caesar’s Palace, is not inexpensive running between $200 and $400 depending on the day and season. A caddy, at least one per foursome is required and the $25 per player caddy fee (plus tip) is in addition to the green fee. Make no mistake this is a very difficult golf course that from the rear tee set stretches an intimidating 7,137-yards. Our group chose to tee it up from the much more player-friendly blue tees at 6,664-yards but still found, even with the altitude assist, pulling the proper club for approach shots to be a real test. A good example is the par-4 14th hole that from our tees played to just over 400-yards. The downhill tee s hot crosses over a stream which you then must skirt as the water continues down the right side of the fairway to form an intimidating pond just in front of the green and making the approach shot all carry. Standing on the tee box it’s easy to be almost mesmerized by the view but then, that’s a feeling you will have time and again during your Cascata round. Some may take issue with the par-5 18th hole playing to 514-yards since most do not have the length nor accuracy off the tee to carry a corner of desert on the left. This makes the hole a double dogleg with water along the left edge of the fairway until it cuts across to the right. What it leaves then for those who drive the ball 200 to 220-yards is a layup-layup par-5. In my case it was a 4-hyrid down the left edge of the fairway, as close as I dared to the desert and stream, followed by a 2-hybrid to 135-yards and then a 9-iron approach. It would have been nice to see the hole laid out so average length hitters could use a driver from the tee without going through the fairway…but to tell the truth that’s a very minor quibble. 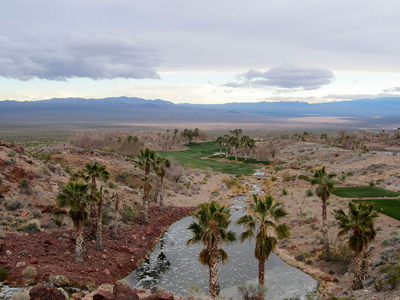 The Cascata experience is truly memorable, each hole presenting its own challenge and most of all Cascata is fun. Oh and did I mention the 418-foot waterfall cascading down the mountain and around the edge of the practice area forming a stream that then passes through the clubhouse? Another lasting memory even if a visitor doesn’t have the thrill of seeing a herd of bighorns. The best advice for playing Cascata is take your “A” game…and a camera.